Marcus Smart never quits on defense because he strives to play the way his older brother Todd lived. Learn more about what inspires Boston's tenacious defender. 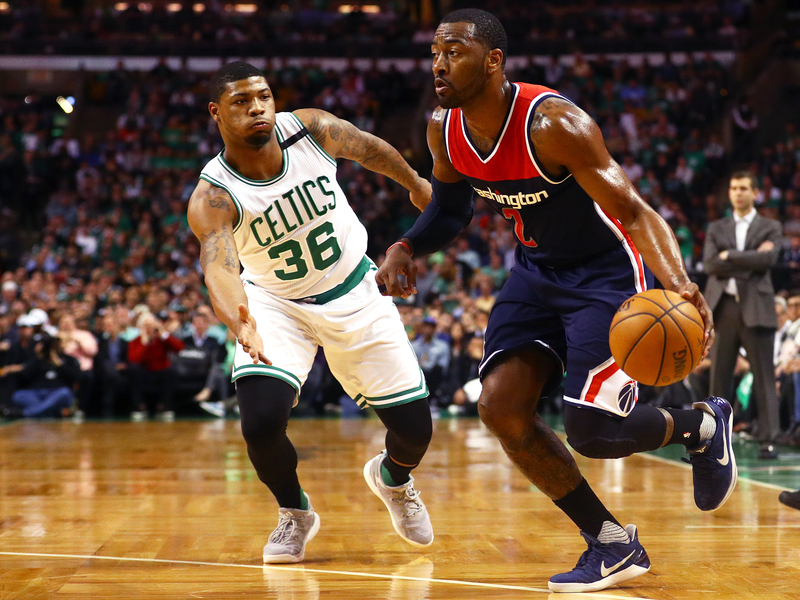 The Boston Celtics and Washington Wizards have split the first four games of their best-of-seven Eastern Conference semifinal match-up, with the Wizards dominating the past two games in D.C. The Celtics look to bounce back at home Wednesday in a pivotal Game 5, and a strong defensive effort will be necessary to contain the likes of John Wall, Bradley Beal, and Otto Porter. Before the start of the playoffs, Boston Celtics guard Marcus Smart connected with The Crossover to explain why he plays defense with such raw emotion. Smart also touched on the toughest defensiveness assignment in the NBA, his charity foundation, as well as the competitive nature of Celtics president Danny Ainge. Justin Barrasso: You dedicated your basketball career to the memory of your late brother. Was he able to see you drafted by the Boston Celtics? Smart: I’m the youngest of four boys, and my oldest brother, Todd, was like a father figure to me. We were very close even though we were 23 years apart. When my parents were working, he was the one there for me. He was diagnosed with lung cancer when he was 15 years old. He had to stop playing basketball and face the fact that his life would be changed forever. Even though he was sick, he was the one making sure I was OK, he was the one checking if I needed help with my homework, and he was the one who taught me how to ride a bike. Todd never had the chance to see me drafted by the Celtics. He fought for 18 years until he lost his battle at the age of 33. He was sick but he never showed it, which spoke volumes to his character and courage. Barrasso: Your specialty on the basketball court is relentless defense. What made the defensive aspect of the game so appealing? Smart: I defend just like my brother Todd lived. He taught me how to play defense by the way he lived his life. I defend like every game is my last game, like anything can be taken away at any moment, and that’s what my brother taught me. That’s what he always preached to me, so that’s how I believe the game should be played. He is never forgotten when I play, and his name will never be lost in vain. Barrasso: Who is the toughest defensive assignment in the NBA? Smart: James Harden. The way he plays, he makes it very hard to defend him. He’s creative, he’s crafty, and he’s a bigger guard so he’s unique for his size. Barrasso: Your brother didn't allow you to see him struggle during his battle with cancer. Your charity, YounGameChanger, helps provide for families with chronically ill children. Why is working with children so important to you? Smart: When I see kids, ones who are so sick, and they light up when they see me, that brings tears to my eyes. I’m able to change the way somebody feels, despite the fact they have every right to feel helpless and down. I’m not a superman with a cape, I’m only a basketball player for the Celtics. But if I can make one child smile, I’ve done my job. I don’t think it was a coincidence that I ended up as a Celtic in Boston. I feel so comfortable here, and I’m here for a reason. These children are a big part of that reason. Barrasso: Celtics president Danny Ainge won two NBA titles with the Celtics and played professional baseball with the Toronto Blue Jays. How competitive is he with you and your teammates? Smart: Danny is still competitive about everything. Even when we’re shooting, just warming up, he’ll walk by and say, “I bet you...” He’ll say things like, “I bet I can throw the football longer than you.” It’s like, "OK Danny, you know you cannot." It’s that competitive nature that makes Danny so great. We like that about Danny. He understands, he’s a competitor himself. He knows and he played. ​Barrasso: Brad Stevens is known across the league for his preparation and in-game adjustments. What do you admire most about him? Smart: I really respect the way he handles himself when we’re down. No matter if we’re going through a tough stretch in a game or we haven’t been winning, he doesn’t lose his cool and holds his composure. That shows a lot about him. Barrasso: What would people be surprised to know about Marcus Smart? Smart: Outside of basketball, I really love to bowl. I’ve also heard of this thing called candlepin bowling around Boston, but I haven’t tried that yet. Barrasso: If you could see any musician in concert, alive or dead, who would it be? Smart: Michael Jackson. Absolutely. I love Michael. I’d see him at any point in his career. Anything Mike did, it was gold. Barrasso: Do you feel comfortable playing in Boston? Smart: I love playing in Boston, and I want to give a huge shout out to the fans. We appreciate everything you do for us, and you’ve always stuck with us, no matter the outcome. We try our hearts out for you, and thank you for all of the support.